Strategically positioned stretch fabric panels on sleeves further improve fit and feel. Subtle black-on-black design provides gives this jacket an elegant, racing aesthetic perfect for the gentleman rider. Pre-curved sleeve construction reduces for an improved riding fit and reduced fatigue. This jacket is built to accept the Tech-Air® Race Airbag System. 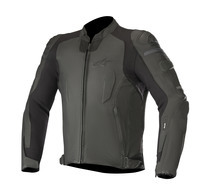 The fit of Alpinestars jackets is generally very predictable. Typically we find these jackets fit sung, but pretty close to the manufacturer’s size chart. But, this jacket is running about one size smaller than normal, so our basic advice would be to buy one size larger than you normally would in an Alpinestars sport style jacket. I’ve put together the following chart to help you choose a size based upon your chest and belly measurement. For each European size, I’m showing our estimate of max chest and belly. Sizing Tip for Those Using Upgraded Armor: Adding chest or back armor to this jacket will change the fit. To account for that, I’d advise you to add one inch to your chest measurement if you plan to add any of these Nucleon back protectors: KR-1i/2i/CELLi. If you plan to add the KR-R racing back protector, add 2” (because it is thicker). Add one more inch if you want to add the KR-Ci chest protectors. The Tech-Air airbag system can be used with this jacket and would be used in place of the back pad and chest protectors. If selecting the air bag system, add 2” to your chest and belly measurements before selecting your jacket size. The new Alpinestars Specter leather jacket offers all the outstanding armor options as their other sport leather jackets but in a more “stealth” style. Subtle logos in matching black leather is the only advertising you’ll be doing! A full armor option list and the capability to use the Tech-Air® airbag system are included. With regard to fit and comfort, I really like the extensive use of materials that give some stretch. Like most other sport styles, this one has the stretch material in the underarm and down the inside of the sleeve, but beyond that, there is a very large leather accordion panel behind each arm and down the side of the torso. Not only does this give a lot of mobility, it is sharp too. I also like the collar design. Its got a short leather band on the sides, but in back its a flexible and breathable panel. And the collar is banded with some soft neoprene too. This jacket ought to be comfortable in most times of the year. You can layer underneath with your own thermal gear to have warmth in the winter and in summer, you’ll get some air flow with the two side zippered vents. And the stretch fabric I spoke about on the insides of the arms will flow some air too. There are some perforations on the leather raised pads on the chest, biceps and in back, but those are cosmetic only. So, you should be able to make this jacket comfortable except for the very warm days in summer. The jacket has a full-around zipper for connection to Alpinestars pants. For night time visibility there are some reflective panels built in (see our night shots in the photo gallery). But those reflective panels are the dark kind so they don’t mess up the stealth motif. There are a lot of options with regard to armor with this jacket. Firstly, you get CE-certified level 1 shoulders and elbow protectors. This jacket also offers options for chest and back protection capability. There are two chest pad compartments in front and the traditional back pad compartment. You can add chest and back protectors (see the links below). Most will opt for the level one or level 2 back pad available to insert in the back protector pocket in the jacket. The jacket will also work with the KR-R level 2 back protector which is worn on the body. We’ve got good descriptions of the options, so just click through the links below to learn more. The shoulders of this jacket have extra external overlays of a rubberized material to beef up the abrasion resistance (the oval raised area with the Alpinestars logo) and they add a bit of style too. As if all the armor options weren’t enough, this jacket is compatible with Alpinestars Tech-Air® street air bag system which is an optional air bag vest that is worn under the jacket and replaces the the optional armor mentioned above. See bulleted description above. MORE ON THIS OPTION LATER. Alpinestars says: Featuring a mapped sports riding fit for precision and comfort, the CE-certified Specter Jacket is constructed from a premium grade leather and incorporates extensive ergonomic four-way stretch fiber inserts which feature a water-repelling treatment for movement and weather performance. With zippered air vents and a removable technical mesh liner with stretch paneling and class-leading protection, the Specter Jacket is also compatible with Alpinestars active airbag technology, Tech-Air®.